Elle Taylor Seiden, the beloved daughter of our friend Jason Seiden, lost her life on July 22, 2018 after bravely battling a debilitating disease called CRPS. 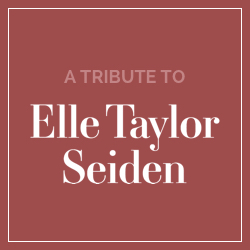 Please join the HR community in supporting the Seiden family and honoring Elle's memory by participating in a Day of Giving on August 10, 2018. To use either of these badges, right-click and save to your device. Write a blog post about your support for the Seiden family and ask for donations to one of Elle's favorite charities. You can use one or both of the badges on this page for your post. Ask your friends and colleagues to donate to one of Elle's favorite charities on your Facebook page. Please feel free to use the badges. Take a photo of something beautiful and post it on Instagram and use the hashtag #ATributeToElle. Or feel free to post a badge on your Instagram account in memory of Elle. Follow the hashtag #ATributeToElle on Twitter and re-tweet fundraising messages and blog posts. You can tweet out a badge on your account, as well. Make your donation and share it with the Seiden family. August 10th is Jason Seiden's birthday. Let's use that day to support Jason and his family during this difficult time. If you have any questions, please contact Mark Stelzner, Laurie Ruettimann, or Susan LaMotte. If you choose to make a donation, please share your donation so the Seiden family is aware of your generosity.